Discussion in 'Air Force & Aviation' started by OPSSG, Apr 7, 2013. We provide links to each of the other F-35 discussion threads above and this is No. 1 of 3 threads on the F-35. This thread dedicated to discussions related to the F-35 Program - General Discussion (covering all common platform issues, like the helmet system, program office news, GAO reports, and weapons integration). (1) The Joint Strike Fighter (JSF) program is the largest single defense program in history. 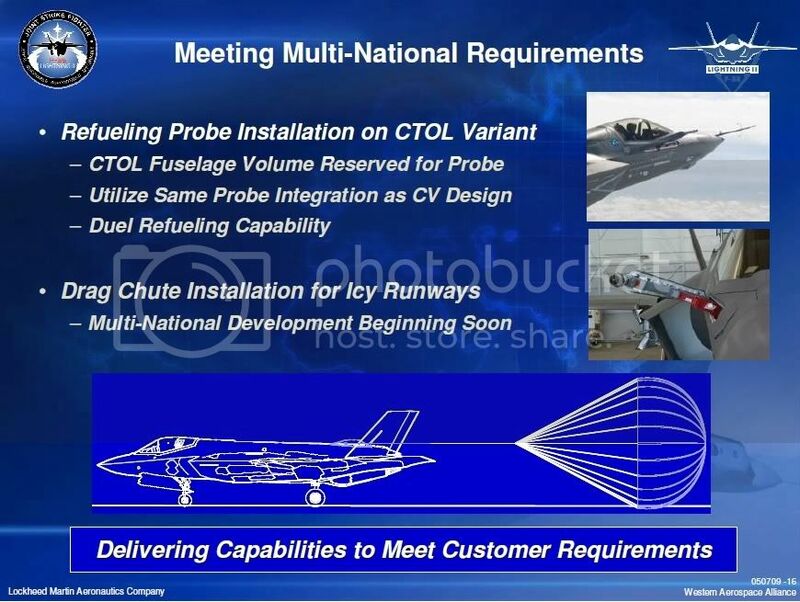 This major multinational program is intended to produce an “exportable” and LO fifth generation fighter in 3 variants. As Lieutenant General David Deptula, USAF (Ret. ), constantly reminded others, the “F” before the F-35 is somewhat of a misnomer. There are significant generational changes in the way individual combat aircraft and fleets of aircraft handle data and can make decisions. Unlike legacy aircraft, which add systems that have to be managed by the pilot; for example, jamming can be performed by the overall system, not just by a dedicated electronic warfare system. The F-35 is also the first combat aircraft that sees completely around itself. The Electro Optical Distributed Aperture System (DAS) makes this happen, and it allows the operator or the fleet managers to see hundreds of miles away on a 360-degree basis. The US Air Force (USAF), the seven international partners, Japan, and Israel are purchasing the CTOL variant. The STOVL variant will be operated by the US Marine Corps (USMC), the UK and Italy. The US Navy (USN) and the USMC are purchasing the CV variant. The ability of the new aircraft to shape distributed air operations collectively is another historic change that the US, its allies and partners need to make, especially with the growing missile, air defense, and offensive air capabilities made available for sale by Europe, Russia and China in the global arms market. See also this August 2012 article by Eshel David and David Fulghum on "Israel, U.S. Agree To $450 Million In F-35 EW Work." (2) In the 2013 review of the JSF program, GAO analysts found DOD officials had made "substantial progress" on several of the fighter's top program management priorities (see link to the 44 page, 2013 GAO report). (i) Advances in aircraft manufacturing, assembly and supply chain logistics have resulted in "labor hours decreasing and deliveries accelerating" despite the fact that initial estimates on production costs and delivery dates were clearly off target, according to the 2013 GAO report. (ii) Program officials were also ahead of schedule for live flight testing on early versions of F-35, conducting more flight tests in 2012 than originally anticipated, according to the GAO. (iii) Through the end of calendar year 2012, the contractor has delivered a total of 52 aircraft –14 test and 38 production aircraft. In March 2012, DOD established a new acquisition program baseline for the F-35 program, and the average procurement at US$137 million (up from US$69 million from October 2001). Nearly 300 F-35s will be purchased before flight testing and development on the fighter are complete. "These actions place the F- 35 program on firmer footing, although aircraft will cost more and deliveries to warfighters will take longer," the 2013 GAO report states. Lockheed Martin also plans to deliver 36 low-rate, initial-production aircraft in fiscal 2013 — an increase of 20% over 2012. The US and eight international partners - Australia, Canada, Denmark, Italy, the Netherlands, Norway, Turkey, and the UK - are contributing to the development costs of the aircraft. (5) On 5 Nov 2012, the Integrated Training Center (ITC) here completed its 500th combined sortie for both the F-35A conventional takeoff and landing (CTOL) and F-35B short takeoff and vertical landing (STOVL) aircraft. On 30 Jan 2013, the assembly of the 100th Lockheed Martin F-35 Lightning II started at the F-35 production facility. Thanks OPSSG, however do you mind elaborate on your statement why canceling B will not made saving in the costs of A and C ? Product cost is volume sensitive. Turkey's move of 1 aircraft fro LRIP Lot-7 to LRIP Lot-9 increased the production cost of each of the 35 lot-7 aircraft by around US$1 million. The JSF needs to ramp up volume after LRIP Lot-9 onwards to drive down cost. If you cancel B. USMC funding for their tac air will go to another non-JSF program, to develop a new aircraft type. Total JSF volume goes down by at least 340 F-35Bs. How is this a cost savings for the US Government? The US will pay much, much, much more for each and every F-35A and F-35C. Thereafter the USMC will take another 10-20 years to develop a new replacement for their tac air (which will cost more $ than sticking to the JSF). For example, when the USMC decided to cancel the troubled Expeditionary Fighting Vehicle in 2010 and replace it with a new armored transport it takes until 2023 or 13 years to field the replacement. If you cancel C, the USN funding will go to another non-JSF program, to develop a new aircraft type. Total JSF volume goes down by 260 + 80 = 340 F-35Cs. How is this a cost savings for the US Government? The US will pay much, much more for each F-35A and F-35B. Thereafter the USN will take another 20-25 years to develop a new replacement for their tac air (which will cost more $ than sticking to the JSF). BTW, the first production model F-35C variant has flown on 15 Feb 2013. In both scenarios, we have not counted to cost of life-extension of existing platforms to be replaced by JSF aircraft for another 10-25 years. You were directed not to post misinformation on the F-35 program and we specifically told you about the misinformation spewed by Winslow Wheeler. Yet you continue to post the same misinformation we warned about, while ignoring prior information provided by the Mod Team (see below). (1) To be clear, we welcome informed criticism of the JSF program but we do not condone the passing-off of known falsehoods to advance an anti-F-35 meme. Winslow Wheeler and POGO are good examples of people or organisations passing-off of known falsehoods by meme. The clever thing about people like Winslow Wheeler, is his cultivation of reporters, who use him as a source to write their articles and these reporters have an interest in selling the same known falsehood to the general public. See this Wired article, Test Pilots: Stealth Jet’s Blind Spot Will Get It ‘Gunned Every Time’, by Mr David Axe, which repeats the same meme (and as a bonus, we also debunk another article from Mr Axe, to show how he removes context from a story he writes to sell a point of view). Reading the example below (an extract of a blog post from the Elements of Power blog), it is clear that how this is done. Further, you are derailing this F-35 Program thread with restarting F-22 production. We have closed the old F-35 thread, with clear instructions for you not to behave in this manner, that you chose to ignore. Further administrative sanctions against you may shall follow. "...The F-35 is a huge problem because of its growing, already unaffordable, cost and its gigantically disappointing performance," the group's Winslow Wheeler said. "That performance would be unacceptable even if the aircraft met its far-too-modest requirements, but it is not." Should North Korea's hostile rhetoric give way to action, the U.S. military has sent F-22 fighters to defend South Korea. These fighters carry a price tag of $143 million each, making them the most expensive in use. It does seem like a re-start of the F-22A could be a possibility. There's been quite some talk around that idea. I know the F-22A could not carry 2,000lb bombs and the sensor fusion is not as great as the F-35, but the trade off, at least for the USAF is good right? The USAF probably could buy 200 F-22As and buy 200 less F-35As. Besides, the USAF has B-2s and B-1s. At 400 or so F-22As, with the latest software, the F-22 will no longer cost $143M, while the F-35A will still not venture to far off the $90-119M price tag. The F-22 line isn't going to get restarted. Where has the talk you mention come from? It's not just a matter of not being able to carry 2000lb class weapons and sensor fusion that's "not as great", there's a whole raft of software architecture issues that go along with operating the F-22. Why do you think they still haven't integrated a helmet-mounted sight and the latest Sidewinder variant into the F-22? Into what's supposed to be the most fearsome aircraft on the planet? Likewise they are still limited from a datalink perspective, there were plans to integrate a common datalink from the F-35 to the F-22, but if I remember correctly the funding was withdrawn. I don't mean any offence, but unless there's been a serious reason (and I mean indication from official, credible sources) to suspect the F-22 will go back into production, then I'm not willing to let this thread, which was just started in order to get rid of some of the confusion of the previous F-35 thread, to turn into some back and forth about the merits and drawbacks of the F-22 or the reasons why it was cancelled OR the logic behind supposedly building more of them. Enough. Unless there's an official source, enough. Please. First of all they are package costs, not aircraft costs. Second of all, F-35 itself isn't $135m even under LRIP contracts today. In future years when larger numbers are being built they will be significantly cheaper. Thirdly, there is no way F-22A could be delivered for $143m a piece any time soon. Only the very last jets of the full rate production phase were that "cheap". Most cost well in excess of $200m per aircraft and re-starting the production line and attempting to get to those mass production facilities, would take most of those 200 odd aircraft, just as it did the first time round for 187 aircraft. You do know the entire F-22A production has ended, the production line packed up and all the component suppliers have moved onto other work, don't you? How much do you reckon it might cost to get them to tool up, to support F-22A manufacture again? As Bonza said, give it a rest. F-22A is finished as far as manufacturing new aircraft is concerned. Lockheed rolled the last F-22 fighter out of its Marietta, Georgia facility last month, but the Air Force is preserving the hardware used to build the jet, which would allow it to restart production for about $200 million. Schwartz said he considered it unlikely that the plane's production would ever be restarted. "I wouldn't say never, but I think it very unlikely," he said. Is defense industry daily and reuters NOT getting the right information? Just like Yahoo did with quoting Mr. Wheeler? So you picked a quote from an article about a separate issue regarding the F-22, and even the quote has a senior Air Force officer saying that the restarting of production is "very unlikely". If anything that reinforces the intent behind my original post. You seem like you're getting pretty chippy with this. I've asked you once, now AD and OPSSG have had their say too. Don't derail the thread with this discussion. Last chance. Again, you are directed not to post misinformation on the F-35 program. Wheeler is a discredited source and his method debunked in detail. You have no more excuse for pretending ignorance. In your specific case, you participated in the old F-35 thread, where false information posted by the Defense Industry Daily has been debunked. We specifically told you about the misinformation spewed by the Defense Industry Daily a week ago in the old F-35 thread. The Mod Team's approach is to help forum members who are confused by directing them to additional information and links to help fill gaps in their knowledge, which led to their confusion. On the other hand, we will be strict with people want to continue spewing misinformation even after we have pointed-out the mistakes contained in their prior posts, to them (and you fall into this unfortunate category). We also require members who contribute to a thread, to read the thread. We repeat the same information in the F-35 International Participation thread (a portion of which is quoted below). It's a complex program... Nothing about it is simple. But some things that appear on mainstream media on the JSF is just not true - as many reporters fundamentally did not take the trouble to read up. ...DID cite APA, whose work would not survive peer review, unless peer review means: Kopp writes a piece, submits it to Goon and Goon approves. DID sources are debunked. As a consequence, you have used-up the prior benefit of doubt given to you. You have 48 hours to retract the statements made by you in this thread. The clock is ticking. Just to add that the $143 m is a flyaway cost of the last buy and not a procurement or acquisition cost. Those costs have to be calculated and added to the $143 m.
I know that the $143 is trying to be used as a total by those that would like to minimise. Defense Advanced Research Projects Agency (DARPA) has a replacement for the Harpoon under development and it is called Navy Long Range Anti-Ship Missile (LRASM). The LRASM program is investing in advanced technologies to provide a leap ahead in US surface warfare capability (and compatible with the US Navy Vertical Launch System). Autonomous guidance algorithms should allow the LRASM to use less-precise target cueing data to pinpoint specific targets in the contested domain. The program also focuses on innovative terminal survivability approaches and precision lethality in the face of advanced counter measures. DARPA decided in January 2012 to focus solely on technology development for LRASM-A, ceasing development of LRASM-B. According to DARPA, the LRASM program is on track to deliver an advanced prototype weapon to the Navy and Air Force with capability for challenging future operational environments, while being sufficiently mature to transition rapidly to an acquisition program to address near-term operational challenges. The LRSAM program will help deal with adversaries armed with anti-satellite weapons that could knock out the GPS satellite constellation. Such adversaries also possess advanced air defense capabilities that make necessary to engage targets from greater standoff ranges. The other anti-ship missile program for the JSF is Norway's Kongsberg Joint Strike Missile (JSM), which is also designed to be carried internally. The JSM will provide a long-range anti-surface weapon and land target capability. In Dec 2011, Norway authorised the development of stage two, of the JSM (see their MOD link in Norwegian, here). In related news, Kongsberg successfully completes fit check of JSM. Further Norway also sought American assurances over the integration of the JSM, in 2012 (see link here). Edit: Below is a 6 June 2013 news link to PICTURES: Why Norway wants the Joint Strike Missile; and more details from Kongsberg on the NSM and JSM, the makers of the missile. ...The low cost, low risk development spiral of JSOW ER extends the standoff range to more than 250 nautical miles. The JSOW family is the only internally carried anti-surface warfare and integrated air defense standoff weapon on the F-35A and F-35C aircraft roadmap. Wow... current capability in excess of 264 nautical miles and the capability to hit a moving maritime target. That is pretty good for a weapon system that is designed to be internally carried on the JSF for the A and C versions. @SpudmanWP or anyone else, do you have more details/timeline on when the JSOW ER will be integrated into the JSF fleet? (i) If required, the space and possibly of installing a probe-and-drogue probe (used by the US Navy) on the F-35A; and drag chute for icy run ways. Gee, I guessed they missed this little tidbit from May of 2009. Whatever happened to research departments at newsrooms and stories having to go through them before publishing? (ii) The prior discussion on Lockheed Martin “Cuda” missile, a medium range air-to-air missile with a multi-mode seeker that defeats targets by direct body-to-body impact. With a length of 70 inches (1.78m), fifth-generation fighters like the Lockheed F-22 Raptor or F-35 would be able to double or triple their air-to-air missile load-outs. Confirmation it's going to use Hit to Kill technology, radar guidance and be sized around SDB size. The rocket motor potentially could take up the majority of the airframe given the HTK nature of the weapon, meaning it can have a useful potential range. (iii) Some basic information on MBDA's Spear Missile (with link to data sheet), a stand-off air-to-ground weapon (multiple internal load on F-35 and high external load on current and future fast jets). Since JSOW-ER is not "official" nothing has been set. That being said, if Raytheon is smart they will have UAI drivers ready for it so it can be integrated as soon as Blk4. Another option is to have a "JSOW emulation" mode so that anything that carries a JSOW can also carry a JSOW-ER. The DoD finally released their 2014 numbers today. Here is what I found. The F-35s are getting cheaper (barely) even though the numbers are the same as last years (19/6/4) for F-35-A/B/C. Some sites are reporting a 4% increase in procurement cost. This is unrelated to the Flyaway and is due to a new RCS verification facility, higher costs for Simulators, Post-SDD development costs, etc. While the USAF has had upgrade costs in the budget for a year now, the USN has now joined in adding LRIP upgrade costs to the budget. They has also broke it down to a Block specific number. The 2B upgrade costs a few hundred thousand (software only) and the 3i upgrade (to include hardware Tech Refresh2) costs $4.6 million per F-35. Concurrency costs are not included in the above numbers. Your update is much appreciated. ...P&W has proposed to the F-35 Joint Program Office (JPO) accelerating the PBL contract to begin in 2015, says Bennett Croswell, president of the company's military engines division. Any moves by contractors and suppliers to lower the annual sustainment cost for the JSF can only help the program. Below is a August 2012 video on the F-35 Factory. My apologies but I recall that the USMC is a separate service though it is a component of the US Department of the Navy. Some quick googling seems to suggest that my recollection is correct but I shall be obliged if you can illuminate in this regard. PS: Had to remove a link in your original post as I am not allowed to post links. Mod: Message pruned as entirety not needed, it would be easier to cross link if a large internal thread. Hi Fireduke86, not really the thread to discuss what the USMC is as it is not relevant to the F-35 program. There would be other more suitable threads for that discussion that can be located with the search function where we can discuss in detail. Also, in future maybe not quote the entire lengthy message to perform a two line reply, it can be confusing to what you are commenting on. Stand guided. Though my intention was to point out the mistake if it really was. The Air Force plans to upgrade all 1,018 of its F-16s and 175 F-15C/D Eagles to keep them flying until the F-35A joint strike fighter is fully operational and new weapons systems on the F-22 Raptor are installed, according to the 2014 budget request released April 10. In the fiscal 2014 budget request, the Air Force states the service life extension for all F-16s will add eight to 10 years to each airframe, along with upgrades to the fighter’s radars, cockpit displays and other communications interfaces. While it's good news that the F-35 seems to be protected from sequestration, I am quite surprised that they are now making a major upgrade of all the F-16. Upgrading 1018 F-16 can't possibly be cheap. The service has left it up to the company to choose a new radar for the USAF's 300 healthiest F-16s. Could this imply that we may expect further delays of the F-35? I thought that production would ramp up very rapidly once we reached that stage? Also, the number of a/c produced per year should become quite high. Is there a risk that this large upgrade could ultimately cut into the number of F-35 that are being bought? In particular I would imagine that the F-16s that gets new AESA radars will stay around for some time. No, this doesn't imply "further" delays. It is a direct result of US Congress demanding concurrency within the F-35 program as a whole and then cutting the dollars to do the work required, as well as cutting the number of LRIP aircraft with which to do the work, with the expected delays from this eventuating and requiring something in the meantime to provide capability.